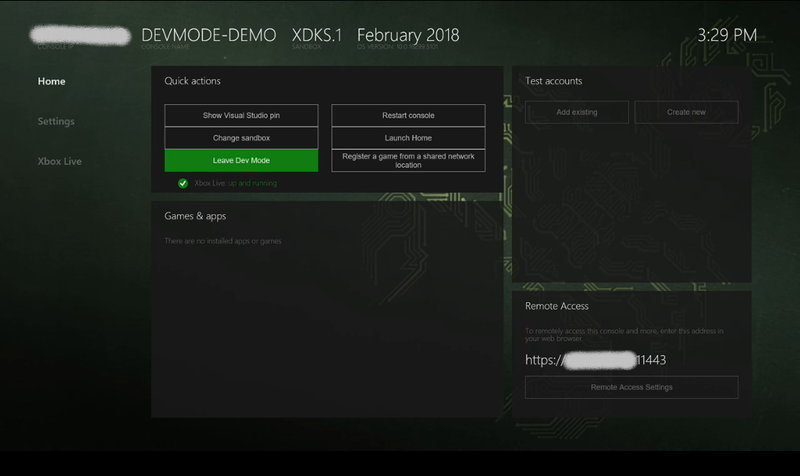 Xbox One has two modes, Retail Mode (1) and Developer Mode (2). In Retail Mode, the console is in the state that any customer or user of an Xbox One console would use: you can play games and run apps as a user. In Developer Mode, you can develop software for the console, but you cannot play retail games or run retail apps. 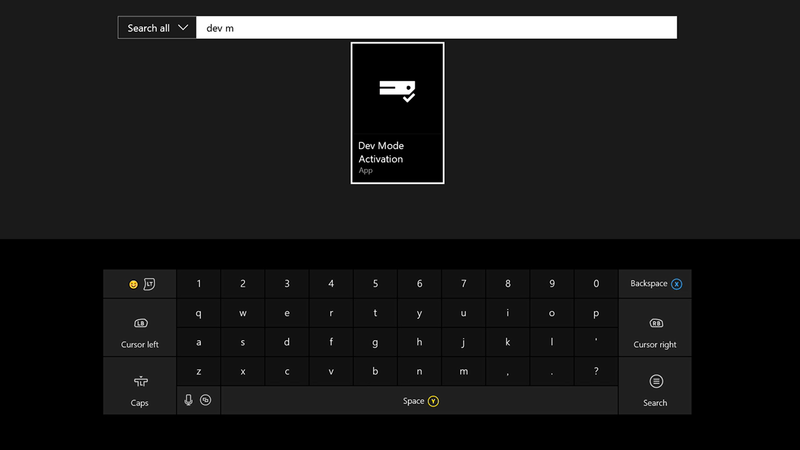 Developer Mode can be enabled on any retail Xbox One console. After Developer Mode is enabled, you can switch back and forth between Retail (2a) and Developer Modes (2b). Start your Xbox One console. 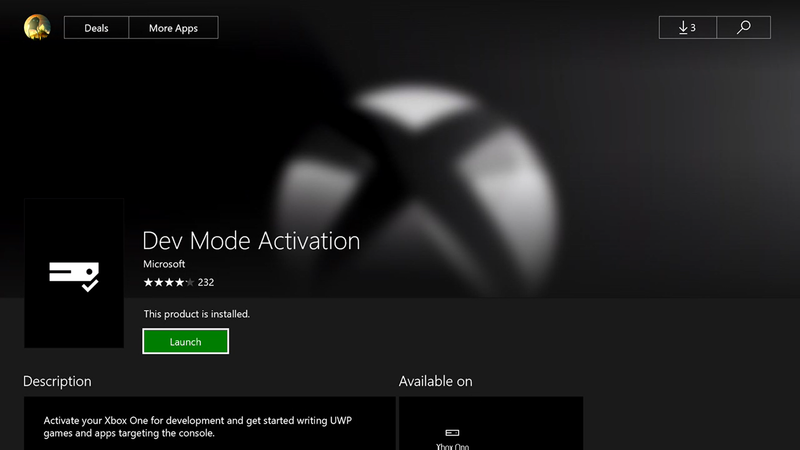 Search for and install the Dev Mode Activation app from the Xbox One store. Launch the app from the Store page. Note the code displayed in the Dev Mode Activation app. Register an app developer account in Partner Center. This is also the first step towards publishing your game. Sign in to Partner Center with your valid, current Partner Center app developer account. If you don't see multiple options in the left hand navigation pane, or don't see the Create a new app option in the Overview section, the following steps and activation links will not work; make sure you fully registered your app developer account from the previous step. 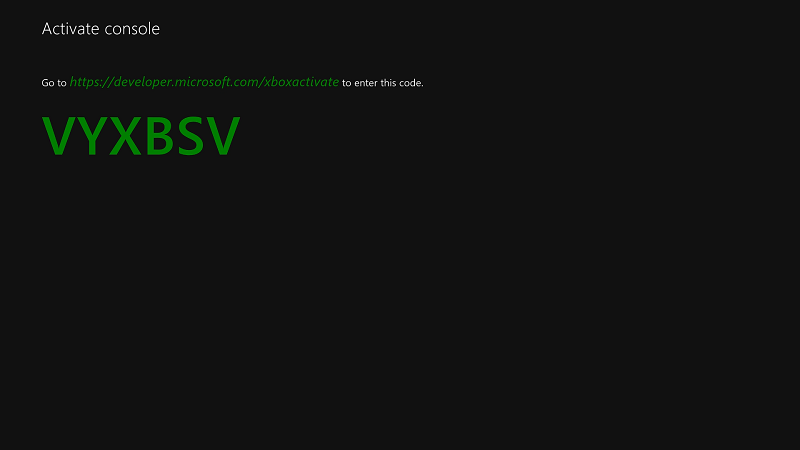 Enter the activation code displayed in the Dev Mode Activation app. You have a limited number of activations associated with your account. After Developer Mode has been activated, Partner Center will indicate you have used one of the activations associated with your account. Click Agree and activate. This will cause the page to reload, and you will see your device populate in the table. Terms for the Xbox One Developer Mode Activation Program agreement can be found at Xbox One Developer Mode Activation Program. After you’ve entered your activation code, your console will display a progress screen for the activation process. After activation has completed, open the Dev Mode Activation app and click Switch and restart to go to Developer Mode. Note that this will take longer than usual. 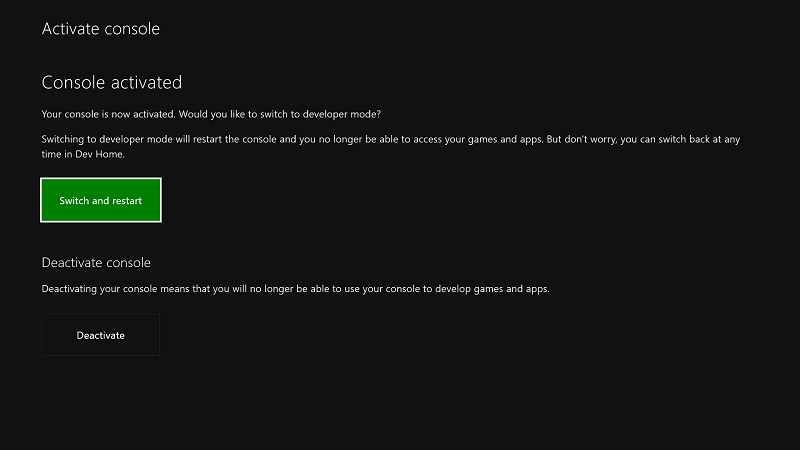 After Developer Mode has been enabled on your console, use Dev Home to switch between Retail Mode and Developer Mode. To learn more about starting and using Dev Home, see Introduction to Xbox One tools. To switch to Retail Mode, open Dev Home. Under Quick Actions, select Leave Dev Mode. This will restart your console in Retail Mode. To switch to Developer Mode, use the Dev Mode Activation app. Open the app and select Switch and restart. This will restart your console in Developer Mode.